The top photoshopped comic strip has been making the rounds lately. And since it's quite obvious that CMU (the acronym is actually trademarked by Central Michigan University) would never make it into a comic strip, I busted out my detective skills and tracked down the original strip. 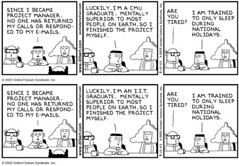 Asok (pronounced "ah-shok") is a brilliant IIT graduate and an intern in Dilbert's company. The character is named after a friend and co-worker of Adams' at Pacific Bell. Asok often solves difficult problems in a few keystrokes, but he is still naive to the cruelties and politics of the business world. As a result, he often ends up being the scapegoat for his coworkers' antics. Despite the fact that he has completed five years as an intern (as of 2004) and performed the functions of a senior engineer, Asok has been denied permission to be a regular employee and the usage of company resources for his work. Asok is also trained to sleep only on national holidays, a trait that he allegedly carried over from his alma mater. The acronym CMU is in fact trademarked by Central Michigan University. I'm not sure if there ever was a lawsuit since I can't find any mention of it. But to keep things simple, Carnegie Mellon insists on using the workmark because of branding reasons. Carnegie Mellon is still a relatively young institution and needs to instill value in its brand, hence the insistence of using the full name. However, students and many of the outside community is still using CMU to describe the institution because we are all lazy. Central Michigan University can't go around and sue everyone for describing Carnegie Mellon as CMU, but it can do something about it when official publications produced by Carnegie Mellon describes the university as CMU. When I worked for Student Affairs this was an important point to get across. That on whatever material I was designing, CMU should not be used and wherever possible, I was to use the official wordmark. Carnegie Mellon beat Central Michigan to the punch (CMU.EDU was registered in 1985, while CMICH.EDU was registered in 1991) and has legitimate use of the domain, Central Michigan University can't sue for the domain nor can they sue whenever someone has @cmu.edu for their email address. So in conclusion, nothing can really stop the public from describing Carnegie Mellon as CMU, but Carnegie Mellon itself is restricted to using the acronym only when referring to the website. Capiche? haha.. funny... people at work are referencing your blog post to describe this cartoon.